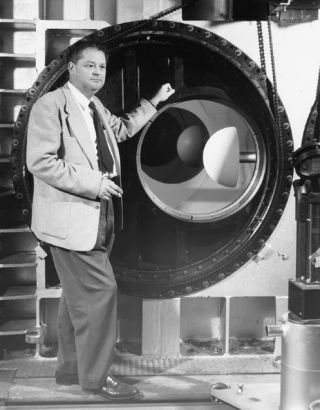 H. Julian Allen, known for his "Blunt Body Theory," beside a NACA wind tunnel. In this historical photo from the U.S. space agency, H. Julian Allen stands beside the observation window of the 8 x 7 foot test section of the NACA Ames Unitary Plan Wind Tunnel in December of 1957. H. Julian Allen is best known for his "Blunt Body Theory" of aerodynamics, a design technique for alleviating the severe re-entry heating problem which was then delaying the development of ballistic missiles. His findings revolutionized the fundamental design of ballistic missle re-entry shapes. Subsequently, applied research led to applications of the "blunt" shape to ballistic missles and spacecraft which were intended to re-enter the Earth's atmosphere. This application led to the design of ablative heat shields that protected the Mercury, Gemini and Apollo astronauts as their space capsules re- entered the Earth's atmosphere. "Harvey" Allen as he was called by most, was not only a brilliant scientist and aeronautical engineer but was also admired for his kindness, thoughtfulness and sense of humor. Among his many other accomplishments, Harvey Allen served as Center Director of the NASA Ames Research Center from 1965 to 1969. He died of a heart attack on January 29, 1977 at the age of 66.